Grundig, Europe’s leading manufacturer of home electronics, today launched its first exclusive kitchen appliance collection in collaboration with the world-renowned and influential chef, Massimo Bottura, at IFA 2018. Announced as Grundig’s official brand ambassador earlier in the year, Bottura has worked closely with the Grundig, to design a small domestic kitchen appliance collection which marries premium quality with design. Designed to meet the demands of home cooks who want a durable high-quality product without compromising on design, the appliances were tested in Bottura’s professional kitchen in his Michelin-star restaurant Osteria Francescana by the chef and his team. Building on Grundig’s heritage of harmonious design, quality and innovation, the Grundig Massimo Bottura collection includes a Kitchen Mixer, Toaster, Coffee Machine, Power Blender and Hand Blender, all adorned with Bottura’s signature and his famous quote ‘cooking is an act of love’, which represents the shared ethos of the chef and Grundig on the importance of respecting food. 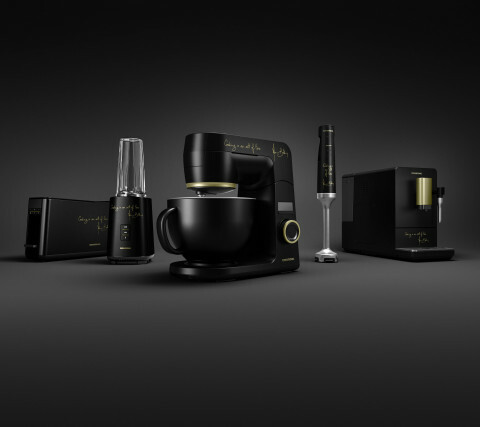 Inspired by Massimo’s personality and obsession with quality, the range is distinctive in a powerful matte black symbolising Massimo’s strong character, and antique-gold to showcase the value of food. The exclusive collection helps home cooks celebrate the joy, love and art that goes into home cooking. This is the first product collaboration with a kitchen brand for the chef, who is recognised as one of the world’s most influential creative geniuses by The New York Times and whose restaurant Osteria Francescana recently topped the 2018 World’s Best Restaurants list for the second time since 2016. Grundig is part of Arçelik A.Ş, the leading home appliances manufacturer of Koç Group, a Fortune Global 500 company. With over 70 years’ experience in the home electronics market, Grundig has become known for its high-quality products and a customer-focused approach. Upon entering the white goods market, Grundig became one of Europe’s sole full-range manufacturer of home electronics. The brand remains true to its brand attributes including its 70 years of experience, user-friendly and elegant design, eco-consciousness, high standards and quality control. With a portfolio of more than 500 different products – ranging from OLED TVs, mobile audio devices, hair styling devices, vacuum cleaners and kitchen appliances to ovens, dishwashers and washing machines – the brand offers a solution for every room in the modern home. Accolades received by Grundig include the Product Design, Red Dot Design and Plus X Awards. The brand has won critical acclaim from Stiftung Warentest, a leading global testing institute in Germany and the Trusted Reviews, an independent UK testing organization. Grundig products are mainly produced in own production sites in Europe and marketed in more than 65 countries around the world.